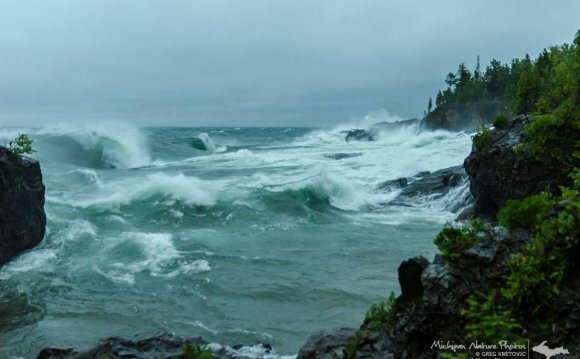 Minnesota's North Shore of Lake Superior is beautiful any time of year, but there is something special about watching the eerie transition of the powerful lake from fluid to ice right in front of you. These images will give you a hint of nature's magic act. This photo of the icy shoreline was taken by William Roleff near Two Harbors in 1911. Norton & Peel took this photo of the ice along the Shore after a storm in 1947; the perspective is especially striking here. This postcard, from 1930, was created with the intention of enticing winter visitors, not scaring them off. 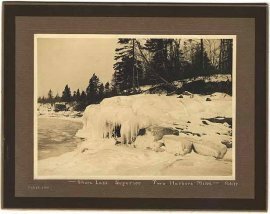 It reads: "Scenic winter vistas along the Shore of Lake Superior, North Shore Drive, Minnesota Arrowhead Country." Showing the waves hitting the rocks and leaving the ice behind, this image by Kenneth Wright is from the winter of 1945. 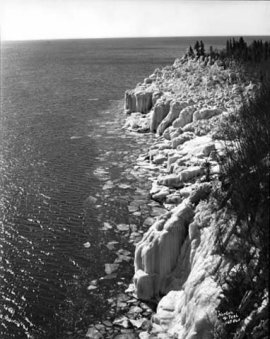 This ice jam image was also taken by Wright, but in 1940. While this is a tremendous photo, what it lacks is the sound - the ice on the lake sounds like one imagines continents shifting would, with the low gurgle of the water underneath, and the whole ice sheet looks like it's breathing.